Mature Vinegar &Dumplings | china-land. I often remark to David what fun it is to live here because we’re ‘surrounded’ by art–supplies, paint, brushes, finished art, trashed art, defaced art, copy art, art. It’s rumored that Dafen is responsible for 80% of the world’s copy art! Speaking of counterfeit I remember reading another story about a woman in New York who was selling ‘original’ works to clients, only to find out they were all fake and her artist was Chinese who fled back to China. Had he been born in the 80s he probably would have come from Dafen. David is one of three original artists in this village. Three years ago I started to visit pretty often and a few months after that, stayed here regularly. 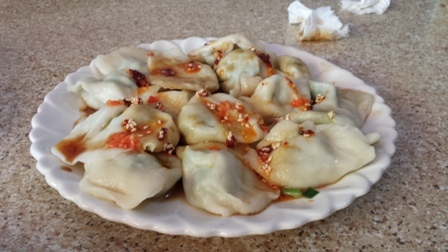 One of the only Chinese foods I would crave [still do] were dumplings and we’d wander everywhere in search. Finally about two blocks from our flat a little ‘northern dishes’ restaurant opened, with a focus on dumplings. This restaurant changed my life. We started going three or four times a week (even now not a week goes by where we don’t make it out there at least once). 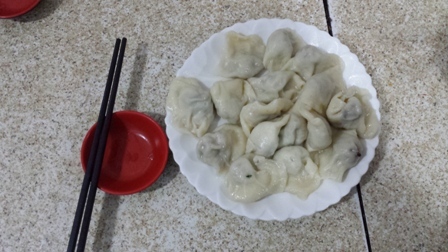 Dumplings back then were just 8 kuai (~1.25$) for a plate of 20 freshly boiled dumplings. Not to mention from the moment you walk in and request your dumplings they begin stuffing away. Everything is fresh and made to order. I’ve also lived and visited plenty of other districts throughout Shenzhen. I’ve never found a more perfect house of dumplings than this one, two blocks from me. minced pork &scallion, minced pork &corn, minced lamb &mushroom, zucchini &egg, scallion &egg. We usually stuck with the vegetarian. My other favorite dish from the north. 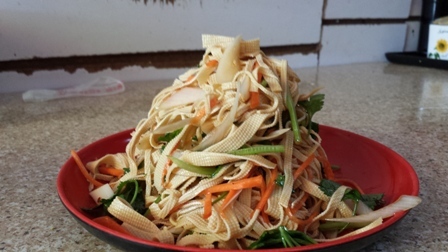 Tofu noodles with carrots, cucumber, cilantro, cabbage, leeks, sesame oil, hunan spice, and a dash of salt. Did I mention House of Dumplings rolls out dough from scratch and makes noodles from the dumpling dough as well? The noodles are also yummy. 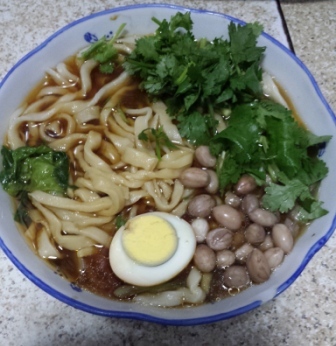 At about 1.25$ for a bowl full of noodles, boiled egg, cilantro, fresh peanuts, and cabbage, this is another frequent Chinese food craving. Every table has an assorted tray of condiments to create your very own dumpling sauce. Each tray has ‘mature vinegar,’ soy sauce, minced garlic, freshly cut cilantro, and two kinds of Hunan chili sauce. Everyone would get a tiny condiment holder to create your own favorite. 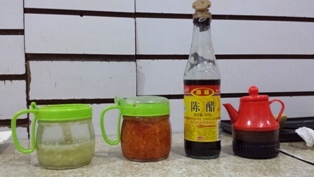 Most Chinese restaurants will have vinegar, soy sauce, and Hunan spice on the table. ‘Mature’ vinegar isn’t as rich as balsamic, i’ve grown to love it and put it on EVERYTHING. Noodles, eggs, peanuts, minced pork, soup, cabbage, potatoes, tofu, feet, everything. 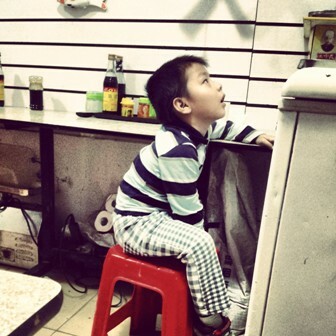 Between vinegar and dumplings, China’s done a number on my pallet and expectations. From the food being extremely fresh to must having Hunan spice and vinegar–to give things just the right kick, I’ve been spoiled. House of Dumplings owners know us and we’ve watched their son grow up right there surrounded by dumplings and art. Three years ago he was a toddler strapped to his grandma’s back as she both stuffed, boiled dumplings, and took money from customers. She’s since retired and our little Host has grown up. He wanders in and out, climbing on stools, opening things he’s not supposed to–resulting in a ‘chopstick whack,’ from his father. I wonder what he’ll grow up to be as he sits in this restaurant twelve hours a day-seven days a week, four years old, and trying to understand where he fits, where he can play, and how to get the right kind of attention. This entry was posted in Uncategorized and tagged art, Chinese cuisine, Chinese food, dafen, Dafen Oil Painting Village, David Lu, dongbei cai, dumplings, growing up, ShenZhen, vegan, village, vinegar. Bookmark the permalink.